Could graphic design be the job for you? The U.S. Bureau of Labor Statistics estimates that the number of graphic designer jobs will grow to more than 300,000 by 2018, a projected increase of 13% from its current ranking. Even though growth prospects will average out to be similar to the average growth for other occupations, high job turnover in the field should result in numerous openings. Are you in graphic design? Or planning to be? If you’re considering pursuing new opportunities in graphic design, check these suggestions on securing and thriving in a graphic design job. As society becomes increasingly visual in nature, projects in interactive media are on the rise, especially for new websites, mobile applications, Web advertising design, and video expansions. And as Internet advertising grows, many signs point to further opportunities for increasing the number of graphic design jobs. Graphic designers are hired by clients to create interactive content on banner ads, landing pages, social media sites, and other interactive forms. Since every company wants interaction on their webpage and product, a well-designed, well-executed campaign can help to make or break a client's sales. Other areas in which graphic design is used is in film (CGI), TV bumpers (including those pop-ups on your screen and segue ads in between programs and ads), animation and Web video. To be a graphic designer, it helps to have a great eye, and good artistic and technical ability. The main focus for a graphic designer is to elevate the visual aspects of a certain project (in those categories mentioned above) and control the process and eye direction of the user (i.e., the reader). Bringing a person's attention to a particular part of a webpage, video, or animated piece is crucial to drive interactivity, responses, and enjoyment of a project. After all, that's what clients want. Poorly designed pages or projects can make people lose interest or divert their attention to the wrong area on the page. This might seem obvious, but it's an art and a science to design. Good design isn't decoration; it's more like problem solving. The trick is to be effective in design, without looking hackneyed, cheesy, or outdated. On average, graphic design graduate degrees take about two to three years to complete. Undergraduates can complete the program in the typical four years. Once finished, graduates usually qualify for a variety of graphic designer positions, depending on the area chosen. As you pursue different degree programs, figure out which aspect of graphic design appeals most to you, and then look into the aspects that are most employable. Animation and website design experience present top opportunities. 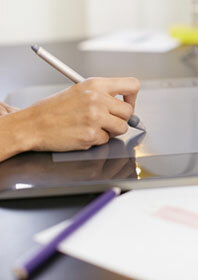 There are many in-person and online graphic design degree programs to choose from. (Full Sail, Parson’s School of Design, and Art Institute are some of the better-known online school options.) Common courses one can expect to take during this phase include principles of design, studio art, commercial graphics production, computerized design, website design, and printing techniques. Once you have your work in graphic design, it's time to learn about master the concepts of collaboration, creativity, and communication. Make sure your professional portfolio features your best work. Show it online so others can see your work in a few clicks. Clients will want to have access to your designs for assessment of your abilities. The right pieces on your website and portfolio can make the difference between a "when can you start?" phone call or a "no thanks." Learn to be comfortable selling. Designers need to communicate well. If you cannot explain your work to clients, who will? Well-rounded people skills are an important factor when choosing to pursue a graphic design degree. It’s something you can’t learn in school, but something innately a part of this job. Lastly, as a little bonus: learn quickly that time is money. The quicker you get quality work back to a client, the more work (and money) you'll receive in return. Businesses expect good work, on time. Budget your time and direction well. Your work alone may bring you clients, but to keep them, you need to be open to suggestions and open to collaboration. Develop a well-rounded relationship with your clients, understanding their likes and dislikes, according to the scope of the particular project. Get the right results to your client. Collaboration is the key to your success. The great thing about graphic design work is that it incorporates much of what makes us creative beings: visual acuity, creative imagination, coherence in structure, economy of elements, and more. If you work in graphic design on a daily basis, your senses are engaged all day, every day. With that mental energy abounding daily, the sky's the limit for taking your graphic design degree to a fulfilling career.